a good, long, soaking, rain and temperatures have dropped to somewhere near ‘normal’ for this time of year. Hard to believe we are at the end of September begining of October! One of the self sowing, perennials in my garden is the Toad Lily (Tricyrtis hirta). This plant has graceful arching foliage of matt, fuzzy, texture and flowers that look like orchids (below) which open along each axil of the leaf. Its bloom time coincides with the first camellias, marking a NEW GARDENING SEASON. Typically the sasanqua camellias bloom through the autumn followed by the japonica type that will continue all winter. More on the differences in the next post, when I welcome you to ‘The Camellia Walk.’… another part of the garden. This entry was posted in Camellias, Perennials, Shade Gardening, Shrubs and tagged autum garden, camellias, Toad Lily. Bookmark the permalink. How fascinating my Camellias wont flower until March/April and my toad lily is in flower now but there is little chance of it self-sowing. Its so interesting to see what is flowering where in the world compared to here. Dear Sandra, Self- sowing Tricyrtis! How splendid that would be when I consider how mine have to be fussed and coddled over in order to stay alive. 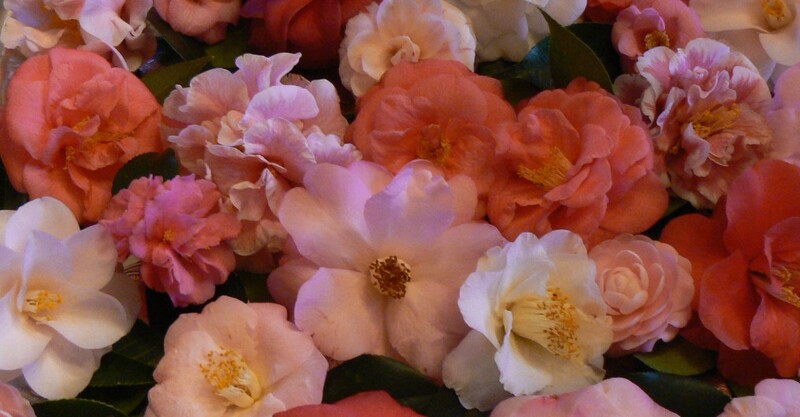 And, the Camellias throughout autumn into winter….how lovely! We have had so much rain lately, I think my garden is floating away.